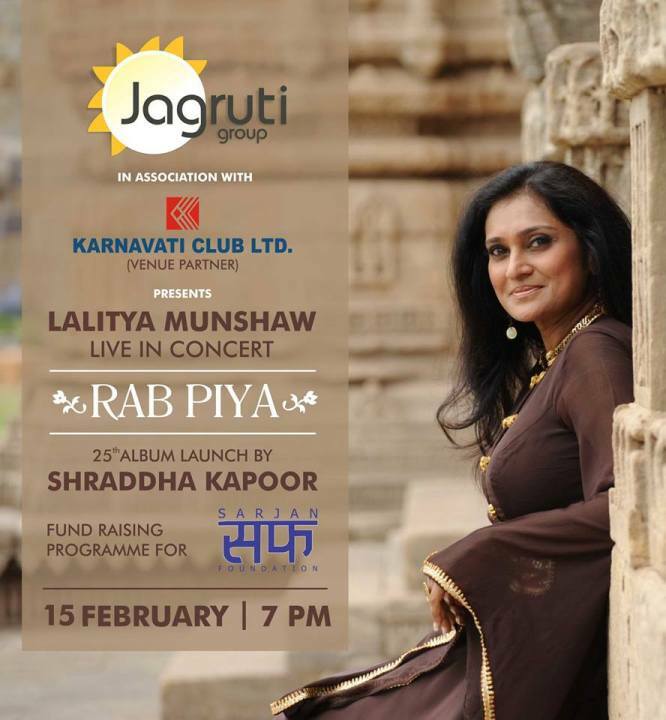 A famous singer Lalitya Munshaw live in concert will be in Ahmedabad on 15 February 2015. At the same event, bollywood actress Shraddha Kapoor will also launch Lalitya Munshaw’s 25th album. Lalitya Munshaw live in concert will be held on 15th February 2015 at Karnanvati club Ahmedabad from 7 pm onwards. Jagruti foundation in association with Karnavati club ltd is organizing this live in concert. The organizers of Lalitya Munshaw’s live in concert are organizing this event for fund raising. Jagruti foundation and Karnavati club ltd are organizing live in concert for fund raising for ‘Sarjan Foundation’ (SF). ‘Aashiqui 2’ fame bollywood actress Shraddha Kapoor will also be there in this live in concert. Shraddha Kapoor will launch Lalitya Munshaw’s 25th album ‘Rab Piya’ at Karnavti club on 15th February 2015. Lalitya Munshaw is a renowned singer and has received extensive training in Hindustani classical music from Ustad Shaukat Khan of Agra Gharana and voice culture training from Padamshri Late Shri Kalyanji and Anandji.